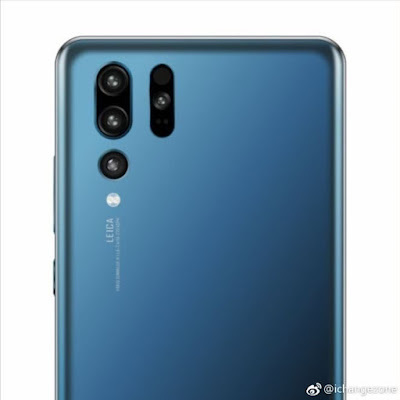 A render of a device said to be the Huawei P30 Pro has surfaced online. The image shows only the rear of the device but gives us a look at the camera setup. The Huawei P20 Pro launched with a triple camera system but it appears Huawei will be adding a fourth sensor to its successor. This fourth sensor is a ToF 3D sensor for scanning 3D objects to use on the phone. You will also be able to use it for real-time motion tracking and even skeletal adjustments when taking photos. The arrangement of the main sensors hasn’t changed. Two of the cameras share a single housing while the third is separated and positioned directly beneath them. Under the third sensor is the LED flash. There is also the LEICA branding which confirms Huawei’s partnership with the German company will continue this year. The ToF 3D camera sits a few millimeters to the right of the first two cameras. It is placed in a housing with similar length but is less thick. There is a black circle above the sensor and below it is the laser autofocus module. The camera configuration of the phone is still unconfirmed but there are rumors that the main sensor is the new 38MP Sony IMX607. It has also been reported that it will feature a periscope camera module for better zoom. The rest of the rumored specs include an OLED dewdrop display and a Kirin 980 processor.